Spelling. Are you looking for Allative case, Delative case, Elative case, or Illative case? What does ablative case mean as a name of something? [grammar]: case used in some languages to indicate movement 'away from' something, removal, separation, source. It corresponds roughly to the English prepositions "from", "away from", and "concerning". The Ablative Case. 29. This case sometimes takes the prefix м, N or È, as FNOBF NtM, from all sin. Sah. ETTNOyTE, from God. R Пмoкмек. from the thoughts. Sah. Kimufal: ablative case (gram.) Kimufalbn : to put in the ablative case. 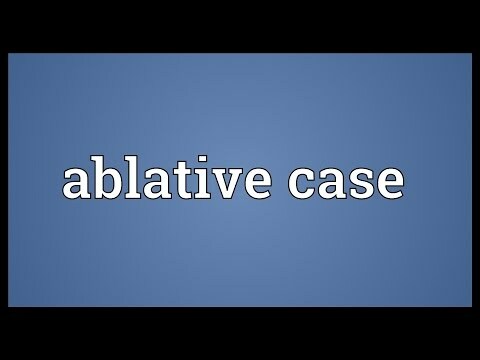 Video shows what ablative case means. A case used in some languages to indicate movement away from something, removal, separation, source. Go to the thesaurus of Ablative case to find many related words and phrases!